Native American Indians were a deeply spiritual people and they communicated their history, thoughts, ideas and dreams from generation to generation through symbols and pictograms such as the Death symbol. Native American symbols are geometric portrayals of celestial bodies, natural phenomena and animal designs. The Owl symbol represents death but death is also conveyed with other signs and symbols. Other symbols were used to convey the reason for death such as diseases like whooping cough and measles. The white settlers and traders brought diseases such as typhoid, cholera, yellow fever, smallpox, measles, whooping cough and influenza to the Native American Indians. Their population fell from 80 million to under 1 million in less than 500 years. The symbols on this page represent the death of a man and a woman. Any Native American symbols that were portrayed upside down signified that they had been killed. The Ojibwa tribe marked the death and burial of a tribe member as shown in the picture of an Ojibwa Grave post - refer to grave post symbols. This was an unusual custom and not practised by many tribes. 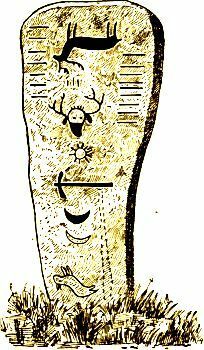 The Ojibwa made the graveposts with great care and they often bore pictures or marks (pictograms) telling about the dead man. His totem animal was often represented, usually upside down to indicate that the bearer of the emblem was dead. The gravepost also tells how old the man was, that he was a warrior and a good hunter. A pictogram, also called a pictograph, conveys a story and meaning through pictures that signify and resemble the shapes of physical objects or people. An Ideagram is another form of pictogram which conveys complex ideas, feelings and emotions. A pictogram, such as the one recognised as a family symbol, is a therefore a form of writing which uses representational, pictorial drawings to tell a story. There were many mourning customs following the death of a tribe member. The friends of the dead might wail and scream loudly, cut off their hair, gash their bodies and they would sometimes chop off their finger tips or whole joints - this particularly ritual was shown in the movie "A Man called Horse". Fires were kindled to supply light or heat to the soul on its long journey.